Introduction: Making the rounds at film festivals in 2006 was a work entitled Beowulf and Grendel, an Icelandic production directed by Sturla Gunnarsson and starring Gerard Butler, who recently played the title role in the film version of Andrew Lloyd Webber’s Phantom of the Opera. Although as of this writing its US distribution has been limited, Beowulf and Grendel will undoubtedly bring the story of the monster-slaying hero to a wider audience and a more prominent place in the popular consciousness. Beowulf, it would seem, is making a comeback. In fact, he never really left us. In twentieth- and twenty-first century Anglophone culture, the impact of Beowulfiana — what we call that amorphous mass of materials that have accumulated around the poem — has been widespread yet subtle. Beowulfiana, it turns out, is a lot like Grendel: always close at hand, but lurking just out of sight. Since the publication of J. R. R. Tolkien’s seminal essay “Beowulf: The Monsters and the Critics” (1936), if we are to select an arbitrary cut-off date, there have been two plays, six musical or symphonic productions, more than a dozen novel-length retellings, at least fifteen children’s books, five comic books or series, numerous poems, parodies, short stories, computer games, films, an episode of Star Trek: Voyager, and even Mardi Gras tokens that have direct connections to the poem. 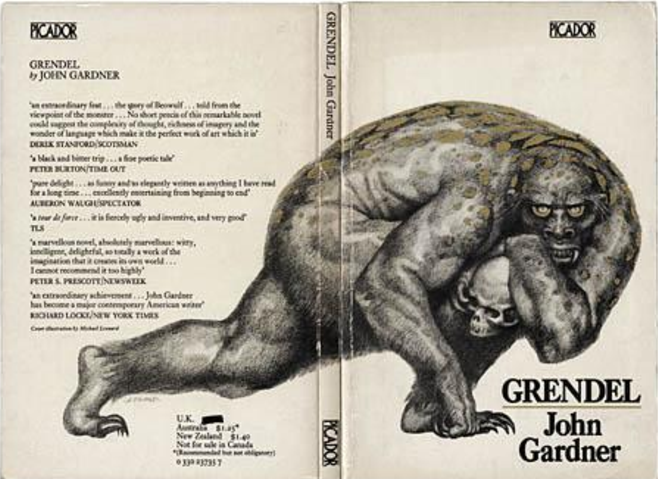 Our intention in this essay, however, is to illustrate how one specific adaptation — John Gardner’s 1971 novel Grendel — acts as a marked turning point in Beowulfiana, after which these disparate materials tend to become far more sophisticated examples of social commentary. In order to demonstrate the effect of Grendel upon subsequent adaptations, we will first consider the nature of Beowulfiana in the decades prior to the novel’s publication. One of the earliest retellings of the poem was a children’s story from 1895 entitled “Beowulf,” by Mara Pratt. This adaptation is from a book called Stories from Old Germany, a compilation of medieval works that are presented like fairy tales. Children’s stories make up the earliest major category of Beowulfiana, and take their place beside the nineteenth- and early-twentieth-century adaptations of other medieval narratives, such as the Arthurian legends and the Robin Hood tradition. Pratt’s “Beowulf” and other contemporaneous children’s versions retell the original story in a very straightforward fashion, deviating from the poem only to relate the events in a different order, to cut out the dragon episode or some other segment of the poem, or to add material that links Beowulf overtly to the Scandinavian literary and mythological tradition. A more renowned “children’s” story to call attention to in this regard is Tolkien’s The Hobbit (1937), which is in large part a rewritten Beowulf, though Tolkien goes much further than his contemporaries in creating a very particular reshaping for very particular purposes. W. H. Canaway’s The Ring-Givers (1958), meanwhile, was the product of a popular author of historical fiction, and it is hard to imagine that Canaway’s work did not help to influence one of the most famous retellings of Beowulf, Rosemary Sutcliff’s Beowulf: Dragonslayer (1961). Though written for children, Sutcliff’s book covers the whole of the epic, from Grendel to his mother to Beowulf’s fall against the dragon. It is a compressed narrative — she cuts the digressions and other “atmospheric” bits of the poem — but an effective one, and it opened interest in Beowulf to a whole generation of English readers.